Prayer, rallies, town hall meetings, networking and organizing won what supporters saw as a “victory” for Mumia Abu-Jamal. The power of the people will not be denied! On Thursday, December 28, 2018 the “unthinkable” for some people happened. Philadelphia Common Pleas Judge Leon Tucker found that former Justice Ronald Castille should have recused himself from Mumia’s case because of statements he made as a prosecutor about police killers that suggested a potential bias. Statements included campaign speeches and letters advocating for issuance of death warrants in such cases. Anthony Williams of Real Justice of Philadelphia speaks at recent rally. “The very pointed issue before this court is whether the former Chief Justice of the Pennsylvania Supreme Court, Ronald Castille, had significant personal involvement in a critical decision of Petitioner’s PCRA (Post-Conviction Relief Act) appeals before the Supreme Court of Pennsylvania, as a justice of that court without bias. To be stated alternatively, whether Petitioner’s PCRA appeals to the Pennsylvania Supreme Court were tainted by Justice Castille’s refusal to recuse, even if Justice Castille’s participation was not determinative of Petitioner’s PCRA appeals; and was the appellate PCRA tribunal an unbiased tribunal as mandated by the due process clause of the United States Constitution and Williams (Id. 136 S.Ct. 1899),” the ruling stated in part. 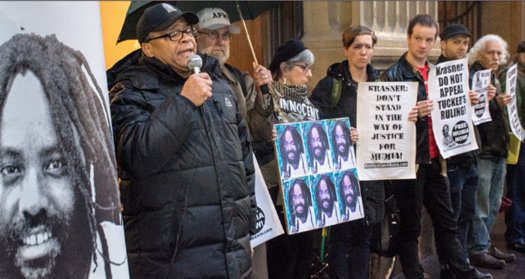 As a result of this ruling, Mumia can file a “new appeal,” to the Pennsylvania Superior Court on all issues that were denied by the Pennsylvania Supreme Court while former District Attorney Ronald Castille was a justice on the court. Many of Mumia’s supporters argue he is a political prisoner and that he was wrongly convicted of the 1982 shooting death of a Philadelphia police officer. Rachel Wolkenstein, is a life-long political activist and an attorney for over 40 years defending civil liberties and civil rights, focused on the exercise of First Amendment rights, challenging the injustices of the American judicial system in criminal prosecutions and opposing the racist death penalty. She assisted in building a world-wide campaign for Mumia Abu-Jamal. This writer attended a rally in the rain held December 28, 2018, outside Atty. Krasner’s office with nearly three dozen people to demand that he not challenge Judge Tucker’s ruling. Among speakers at the rally were this writer, Sister Pam Africa; International Concerned Family and Friends of Mumia Abu-Jamal, Brother Diop Olugbala; Black Is Back Coalition, Brother Anthony Williams and Sister Megan Malachi of RealJustice of Philadelphia. “The people’s movement is responsible for this victory,” Sister Pam Africa said to those gathered. 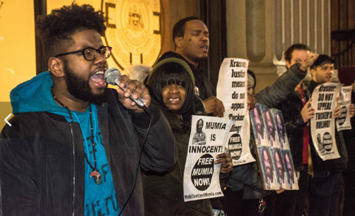 Judge Tucker’s decision means Mumia’s appeal of his Conviction, and his argument that he was framed by police and the prosecution manufacturing evidence of guilt and suppressing proof of his innocence as well as other due process trial rights, are restored and must be re-heard in the Pennsylvania Appeals Court. Mumia has always maintained his innocence in the fatal shooting of Off. Daniel Faulkner. Mumia’s prosecution was politically motivated argue his supporters, because of his Black Panther Party membership, his support of the MOVE organization and his work as a journalist. Mumia’s trial was racially biased. Trial judge Albert Sabo declared. “I’m gonna help them fry the n----r,” and the prosecution excluded Blacks from the jury. After 37 years of his unjust lock-down in prison for a crime he didn’t commit, the charges must be dismissed. FREE MUMIA ABU-JAMAL NOW! The Nation of Islam Prison Reform Ministry, DVR will continue to stand with Sister Pam Africa and those with her on behalf of the Honorable Minister Louis Farrakhan and his Student National Prison Reform Minister Abdullah Muhammad to bring Mumia Abu-Jamal home.